Sometimes we can be too close to a thing. Over the past few weeks, when I’ve only been putting between three and four hundred words a day on the next Bliss House manuscript, I’ve felt as though I were operating a kind of microscope in reverse. Observing tiny dots of detail backwards through the lens, not exactly certain how they will work in the universe at large. Or maybe a better example is a pointillist painting. Pointilism is a school of art that uses tiny dots to create a larger image. One of the most famous practitioners was Georges Seurat. Here’s a detail from one of his paintings, A Sunday on La Grand Jatte. If you look closely, you can see that the figures are not well-defined. The woman’s eye appears only to be a suggestion of an eye. The young girl has no features on her face at all. Only shadows. Pointillists didn’t blend their colors–they grouped individually colored dots so that they would create another color altogether. 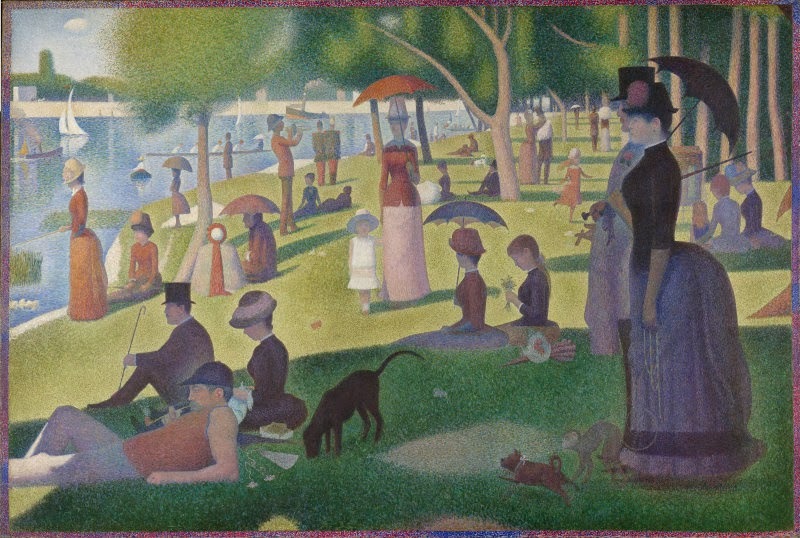 Seurat’s work is highly stylized, but when viewed at a distance, the painting looks much more like life. While the lengths of my paragraphs vary, you might imagine 300-400 words as two long or three relatively short paragraphs. Or you might think of it as a brief conversation between two characters, which is what I worked on today. In that conversation, a new, minor character is introduced, but his presence and actions will have a huge effect on the protagonist/narrator’s life. But I spent the majority of my writing time on his mannerisms, his speech (or lack thereof), and the assumptions that Charlotte (the protagonist) makes about him. I suspect the reader won’t think much about him when he first appears. He seems insignificant. Collectively (bear with me here!) he is a moustache, tight skin, paint-stained clothes, a haircut from another era, a nervous laugh. He is a character whose significance will only be apparent after another 10,000 words. Two days ago I was working on a single dinner party scene. And before that, an intense marital negotiation that lasted only a few seconds. But too many days of small movements forward on the book are beginning to wear on me. 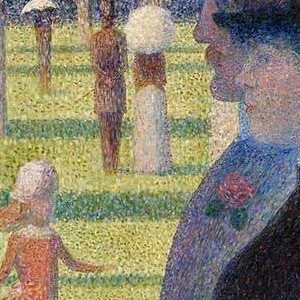 How long, I wonder, did Seurat labor over the shape of the rose on a man’s lapel? Did he immediately move on to the flower on the woman’s hat? Or did he pencil in the small boats on the river. (I’m just guessing, but I suspect he had the entire painting sketched and measured out well before he picked up a brush. I don’t outline my novels all at once, and then fill in the prose. But that’s a whole other blog post–at least.) It’s time for me to step away and at least sketch out the next few chapters. I fear I have lost my way. Though this happens with every book I write. The middle gets muddled for a while until I can re-focus on the big picture again. Oh, and happy Friday the 13th!